There’s no denying that one of the biggest worries investors had in 2018, and a big cause of the sharpest correction in a decade, was the Fed hiking rates so aggressively (four times). In fact, the Fed’s December rate guidance and Powell’s comment that the balance sheet roll off was on “autopilot” is largely what caused the S&P 500 to plunge to its December 24th lows (19.8% from the September 20th high). Well, investors prayer’s have been answered and the Fed has announced its steady rate hike plan is done with. But while Wall Street has reacted with predictable enthusiasm, smart investors know that the world is more complicated than what you hear on CNBC or Fox Business. So let’s take a look at what the Fed’s plans for interest rates actually are, and more importantly what that really means for your portfolio, both in 2019 and well beyond. 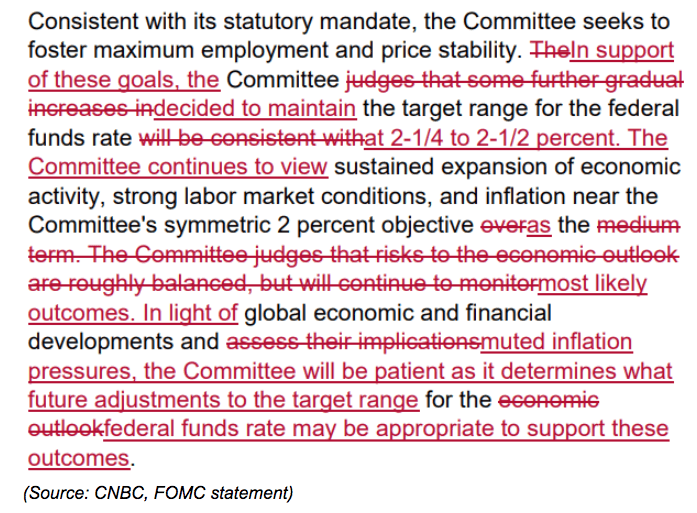 Given the market tantrum that occurred after the Fed’s December guidance showed two more rate hikes scheduled for January, it’s understandable that the Federal Open Market Committee or FOMC’s January statement was taken as a reason to celebrate. The big things that investors focused on was the Fed’s emphasis on “muted inflation pressures” and plan to be “patient” with future hikes. And lest you think I’m reading to much of a policy pivot into the Fed’s arcane and dry verbiage, consider that this week Powell put any questions of the Fed’s new approach by saying that we’re now at the neutral interest rate and the Fed is as likely to cut rates as it is to raise them from current levels. 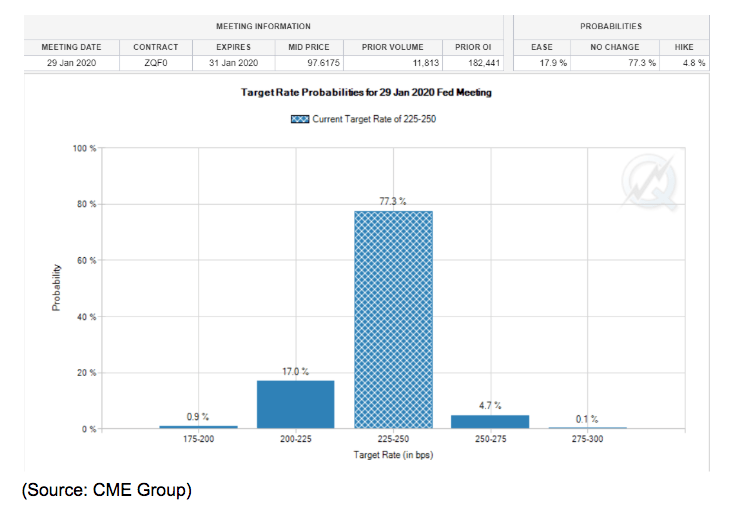 The bond futures market actually believes that the probability of a rate cut (17.8%) within a year is about four times that of another hike (4.8%). But the bottom line is that the Fed is done hiking rates as long as core inflation (based on the Personal Consumption Expenditure Index) remains at 2% or less. 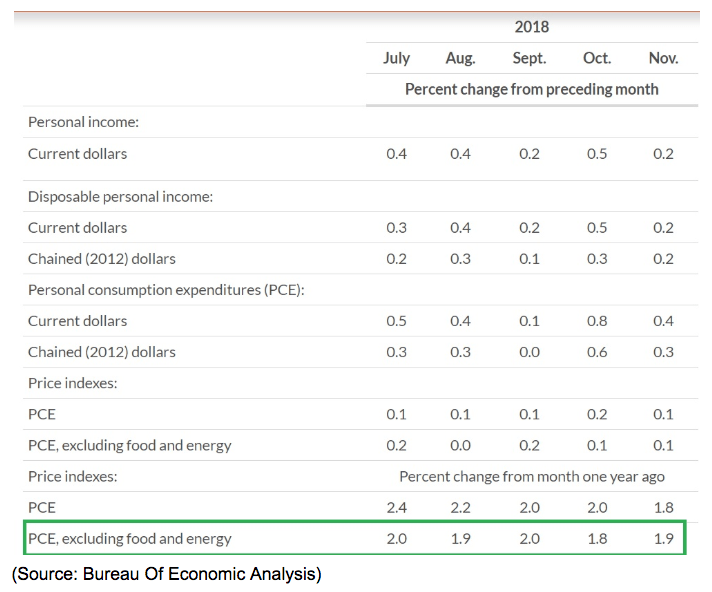 The partial government shutdown has caused a large backlog of economic data, including inflation, but the last official release of core PCE showed inflation holding steady at under 2%. How likely is inflation to not pick up in the coming months? Well to estimate that we can consider the bond market’s long-term inflation expectations based on the Consumer Price Index or CPI. The difference in 10-year yields and those of Treasury Inflation Protected Securities or TIPS, tells us what the bond market expects CPI to be over any given period. Most recently the bond market was predicting CPI (which usually runs 0.1% to 0.3% above core PCE) will be 1.9% over the next 10 years. As long as this inflation break even rate is at 2.1% or less it’s very unlikely the Fed will hike even more time this cycle. Ok, so the Fed appears to be done hiking rates barring some unexpected pickup in economic growth and inflation expectations. But what does that actually mean for investors? In the short-term stocks are celebrating what some cynics call the Fed capitulating to the market and reinstating the “Fed Put” or the idea that the Fed won’t let stocks fall hard for fear of a “negative wealth effect” potentially hurting consumer spending and thus leading us into a recession. In reality, there are two important things investors need to keep in mind. First, no more rate hikes don’t necessarily give stocks a green light to surge steadily higher in a replay of 2017’s freakish 20% rally (the second lowest volatility in market history). It merely eliminates one of the biggest risk factors for stocks, which are now free to focus on fundamentals (like earnings) and return to historical valuations. As of February 1st’s close, the S&P 500’s forward PE ratio was 15.7 which is just below the 20 year average of 16.0. That means that broadly speaking, stocks are free to rise this year in line with whatever earnings growth will be (about 8% more according to FactSet Research). Of course, stocks usually do become overvalued so we might see a stronger rally, especially if we get a trade breakthrough in February (which is very likely to happen). More importantly, though, the Fed is not “capitulating to the STOCK market” but rather wisely listening to overall credit markets, which is a very good thing given that the financial industry is about four times the size of America’s GDP. You can track the general health of the US financial market (the lifeblood of our economy) via the St. Louis Fed’s weekly Financial Stress Index. Zero is the average since 1993 and usually a reading of 1 or higher is what occurs before a recession begins. The Financial Crisis saw the index soar to 5.3 but this index was clearly signaling the start of the Great Recession long before the financial markets melted down. What caused the Fed to sit up and pay attention wasn’t the market’s 20% crash, but financial stress going from -1.3 at the end of August 2018 to -.51 by the end of the year. That rapid and sharp increase in financial stress can be seen by credit markets starting to tighten (no corporations sold new junk bonds in December, the first such month since 2011). Today the Financial Stress Index is back to a nice safe -0.92 indicating credit markets are working as they normally do in a healthy economy. But while the short-term outlook for stocks is now positive, given current valuations (fair value) and the current earnings growth outlook for stocks (modest growth for the year) what’s far more important for investors to pay attention to is the long-term fundamentals and how the Fed’s new policy stance will interact with that. I find it sad that the market got so used to low rates due to weak growth that now investors seem to prefer bad economic news as long as it means rates stay low. Ultimately stock prices are a function of earnings and cash flows and those do well in a rising economy that sees healthy wage growth that drives good consumer spending (68% of US economy in Q4). According to the Bureau of Labor Statistics, the tightest job market in decades has caused average wage growth for non-supervisors (80% of workers) to hit 3.4% YOY in January. That’s the fastest wage growth in 12 years. Meanwhile, median wage growth hit 3.8% in December, the last month for which data is available (due to shutdown). During healthy expansions, average wage growth for all workers (per the BLS’s official metric) is usually 3.5% to 4%. It’s currently 3.2% but slowly rising closer to the lower range of normal. A big worry that many investors have (and the reason for the early 2018 correction) was a sharper than expected increase in wage growth (+2.9% YOY in January) that caused a spike in long-term interest rates. The Fed keeps a close eye on unemployment (the headline U3 rate) because under the Philips Curve (one of its key economic models) falling unemployment leads to higher wage growth and inflation. But in reality, the sharp decline in the labor participation rate, which didn’t start recovering until 2015, means that there are still about 8 million discouraged workers on the sidelines. 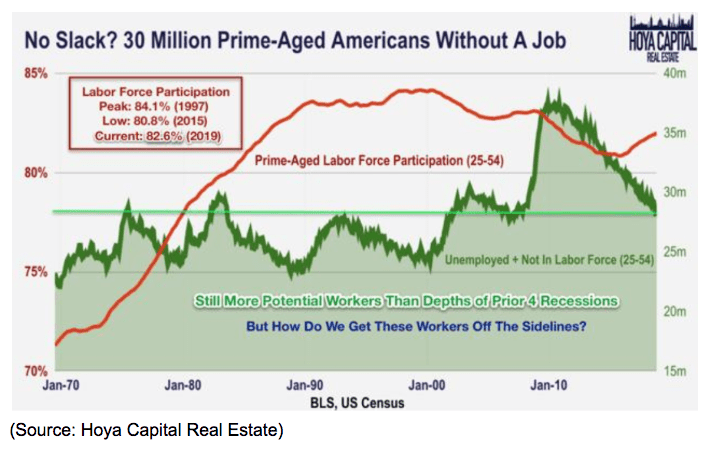 Or to put another way, if we continue the current rate of job creation (3-month average 241K) for another three years we’ll get back to 2007 levels of participation and then maybe inflation will start rising above the Fed’s target. Of course, if job creation does hold up, as we should all hope, then the Fed will eventually have to raise rates again. And long-term interest rates (10 and 30-year yields) will also move higher, but that’s nothing to fear. Since 1963 stocks have not actually been hurt by rising interest rates until the 10-year yield went above 5%. We’re currently at about 2.75% or roughly half that amount. What’s more, stocks actually do better in a gradually rising rate environment. Between 1995 and 2017 stocks did best in a bear steepening yield curve regime, meaning that long-term rates were actually rising faster than short-term rates (which the Fed controls via rate hikes). That’s because a strong economy means both higher inflation expectations AND higher opportunity costs for bonds relative to stocks. That makes intuitive sense if you think of it like this. Say you expect the economy to be good and so corporate profits are likely to grow and stocks will generate good returns, close to their historical 9.1% CAGR. In that kind of environment why settle for 3% yields on a risk-free treasury? 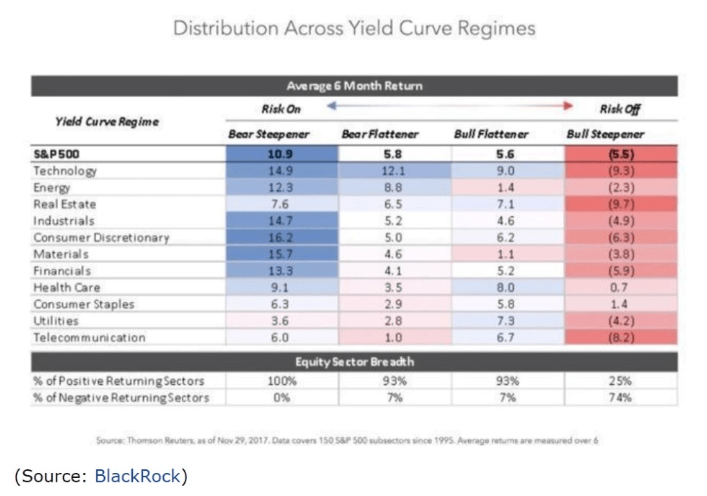 Indeed when bond investors are bullish on the economy they expect higher inflation and also demand to be compensated for tying up their money for long stretches of time which is why rising long-term rates are actually a good sign for long-term market returns. In contrast, falling 10 and 30-year yields (a flattening yield curve) is a sign that the bond market (the best recession predictor in history) thinks the economy will be weak or even contract, and earnings growth will be low or negative. In that scenario falling stock prices means that it makes sense to accept a low risk-free rate which is better than a negative return bond investors expect from the stock market. 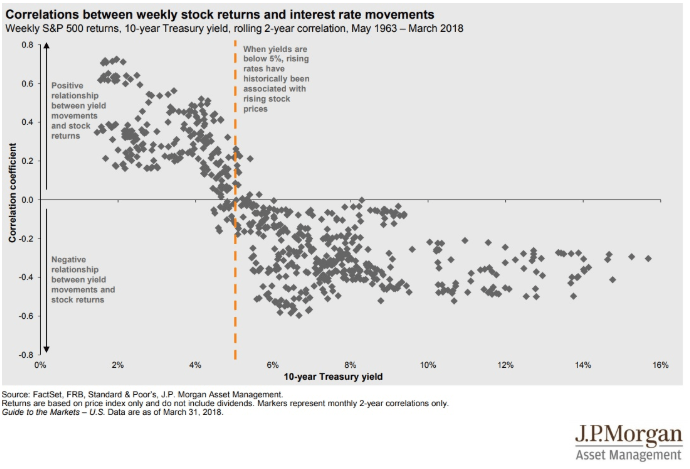 Now it’s true that long-term yields rising quickly can cause short-term market corrections. But as long as the economy is healthy long-term rates should gradually move up and that’s something investors should hope for. Basically, what I’m saying is that the Fed ending its rate hikes for the foreseeable future (no more hiking bias) means that a major recession risk has been removed and now the economy is free to grow on its own. If job creation remains strong enough to keep pushing up wage growth (150K+ per month) then eventually wage growth will rise high enough to push up both short-term rates (more Fed hikes) and long-term rates (rising inflation expectations). But that’s a good thing for both Main Street and Wall Street, so don’t fear good economic news, or freak out about the Media’s unhealthy obsession with rates staying lower forever. I’m not a market timer, but a long-term fundamental driven dividend investor. Thus I’m not scared of a hawkish Fed “taking away the punchbowl”. At least not in terms of short-term market valuations. What I and all investors should focus on, is the fundamentals, both for the economy and for the company’s we own. While the market may be celebrating the end of Fed rate hikes for the temporary boost that might give to share prices, I’m far more excited that the Fed is now clearing the way for the best job market in decades to keep getting stronger. While the US economy faces many risks in 2019 and 2020, the accelerating job creation we’re seeing now is very bullish for both workers, and in the long-term, for company’s as well. Rising wage growth will keep consumer spending strong, limit recession risk, and ultimately incentivize company’s to boost productivity through greater capex investments. That’s a formula for stronger than expected economic growth to continue not just in 2019 and 2020 but potentially for many years to come. But it’s important to remember that the Fed sleeps with one eye on the Philips Curve at all times which is why investors have to remember that the Fed isn’t necessarily done with rates hikes for good, just rate hikes for now. 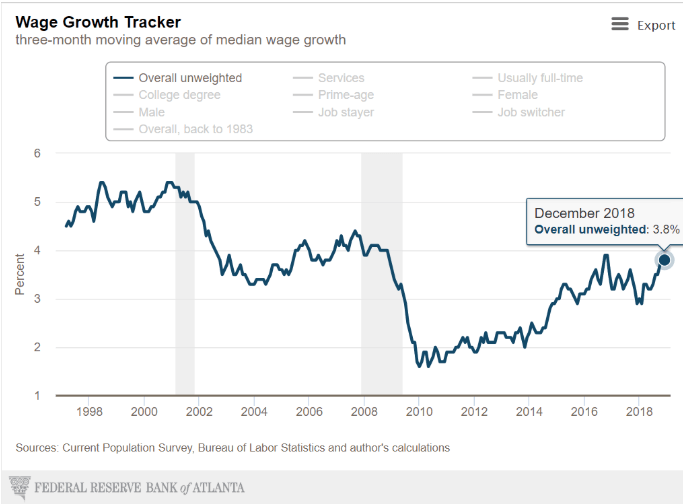 If the economic expansion continues for a few more years, then the ever-tightening labor market and wage growth rising closer to 4% per year (per the official government metrics) is likely to cause the Fed to hike yet again. Fortunately, both market history and common sense tell us that slowly rising rates are actually good for stocks, as long as they are a result of strong economic fundamentals that ultimately drive faster earnings growth. But of course, Wall Street is neither famous for its long-term focus nor its nuanced view of the big picture. So while it’s ok to celebrate the end of Fed rate hikes for now, just remember that the best case scenario we’re actually rooting for might see the Fed take a more hawkish stance later which might result in more temporary and irrational market freakouts. Fortunately, stock prices falling in the face of strong fundamentals are the best opportunity for income investors to lock in better yields and stronger future returns. 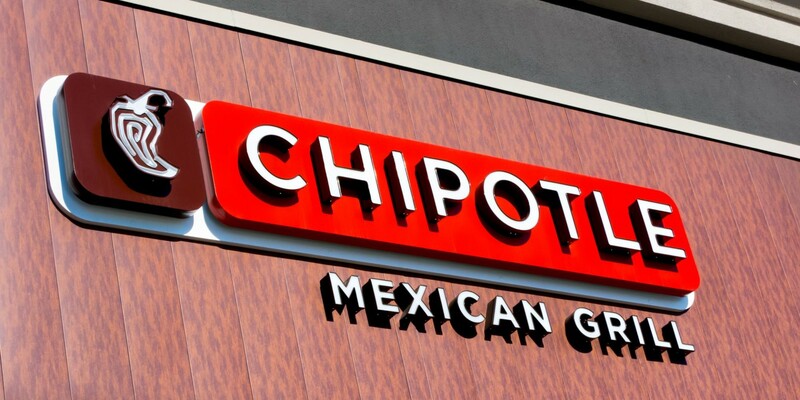 That’s why my new Deep Value Dividend Growth Portfolio (beating the market by 9.9% so far) is built around five such watchlists of quality, low-risk dividend companies that I buy opportunistically during irrational market freakouts.